My first exposure to Thai food was at this place called Tamarind in La Mesa, a suburb of San Diego where I grew up. 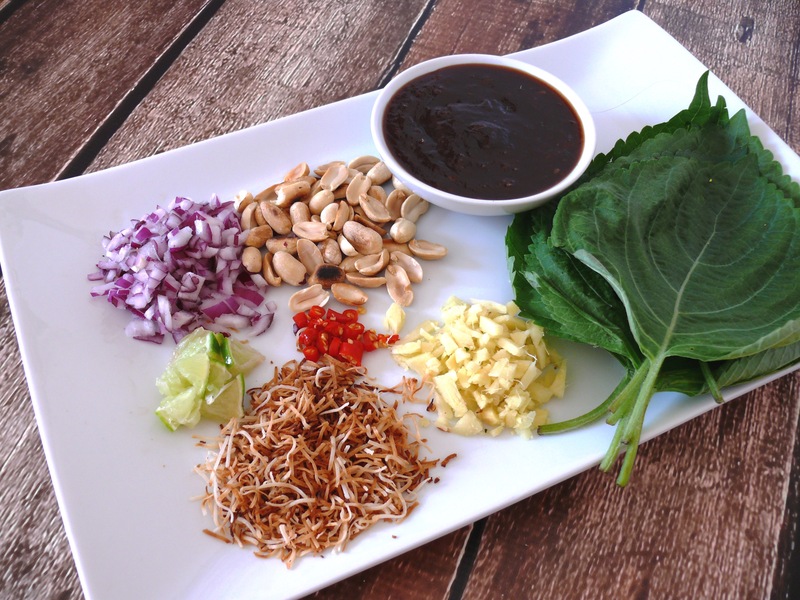 We always ordered the miang kham, a delicious Thai appetizer of leaves filled with shrimp, lime (skin on), shallots, toasted coconut, toasted peanuts and a sticky sweet and tangy sauce. Amazing. Also, my sister in law absolutely loves the appetizer, so I thought it was time to give a vegetarian version a try! I used this recipe on Real Thai Recipes as a guide. I replaced the fish sauce with fermented soy beans, skipped the shrimp, and added tamarind to the sauce because I like the tang it gives. At the Tamarind restaurant they used lettuce, but betel leaves are traditionally used. I was at a Korean market recently and picked up some nice big shiso leaves so I used those and they worked great! Next time I’m at a Thai market I’ll see if they have betel leaves. Grind all the sauce ingredients in a little food processor with just a little of the water. Toast the coconut until browned but not burnt. Scrape the sauce into a little sauce pan adding the rest of the water and 2 tablespoons of the toasted coconut and cook until reduced to a thick sticky sauce. On a platter or in small bowls put all the ingredients. Make each parcel by taking a leaf, adding coconut, peanuts, onions, ginger, red chili and topping with sauce. Delish!